Nightwing faces off against his ancestor, as their fight takes them across Gotham and into the subway, where conveniently placed pipe coolant takes care of the Talon. Most of the issue covers William Cobb’s past, from losing his lover and unborn child to society’s pressure, to being scouted and trained as the new Talon. It also answers how the Grayson name came to be, and how his descendants went from being in a rich family, under a different name, to circus performers that were being groomed as assassins. While I enjoyed the latest issue of Catwoman for the Talon’s backstory, I have to admit that I’m a bit more invested in William Cobb’s story. It helps that he’s been built up over more than one issue. His story is one of the strong points of the Court of Owls events, as we get to see his rise and fall, helping us round him out as a character. The fight itself was interesting enough, though I’ve never been all that interested in issues that have nothing but fight scenes (my interest in shonen fighter manga aside). So I can’t really comment on it that much. It’s an entertaining read, but doesn’t stand out from everything else I’ve read. The climax was a bit odd, and seems too much like one of those comic book logic moments where it wouldn’t actually work in real life. But overall I’d rank this as one of the better issues in the Court of Owls event. The secondary story was strong and picked up the slack for the main story. 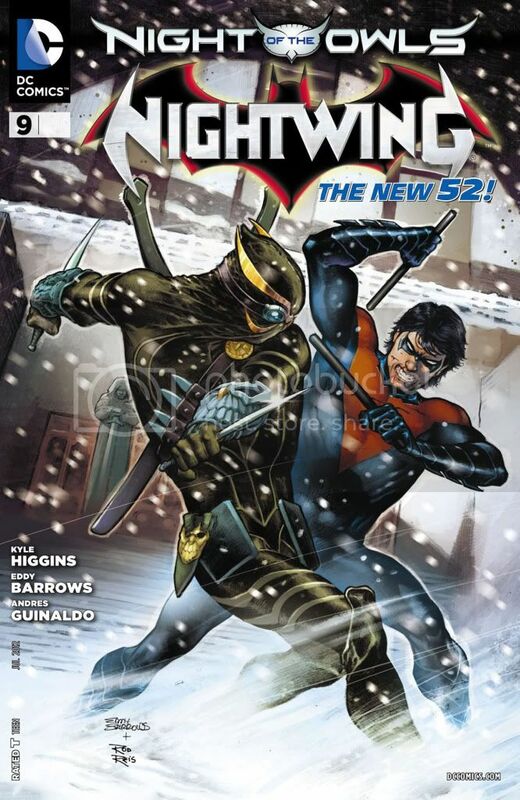 If I could only recommend one series to read alongside Batman in the Court of Owls story, I’d have to recommend Nightwing it’s got the best build up, and took place over more than just one issue. If nothing else it’s the proper companion piece for Batman.